This book was on Anne Bogel's 2016 Summer Reading Guide, and I've heard her mention it many, many times since then. (It's a book she says she never would have read if not for a bookseller's insistence.) When the audio was on sale a few months ago, I purchased it, and I very much enjoyed listening to it. And even though I didn't read it in the summer, I can wholeheartedly get behind it as a perfect summer read. Ona Vitcus, a 104-year-old Lithuanian woman, has grown quite fond of the odd little Boy Scout who comes over to help with jobs around her house when his father shows up in his place one Saturday. She doesn't know he is the boy's father at first and goes off about how she thought she finally had a Boy Scout who was reliable and responsible, but now she sees that he was just the same as the others. But then it comes out that the boy passed away suddenly and Quinn, the boy's father, who was never close to the boy when he was alive, is now there to fulfill the last few weeks of his son's obligation. As the story progresses, we learn more about the boy, who was obsessed with the Guinness Book of World Records and was convinced that Ona Vitcus had a chance at being the oldest living person (if she can hold out for another thirteen years or so and get proof of her birth date . . . ). He asks Ona if he can record her life story. It's for a merit badge for scouts, but as Ona talks, she shares things she hasn't thought about in a couple of lifetimes. Meanwhile, the story moves forward in the present where Quinn develops his own friendship with Ona and confronts some of the issues of his past and the guilt he feels at not having been the father he should have. The structure was fascinating because even though the book is about the boy, he stays somewhat concealed behind the recording of Ona Vitcus' life story, so even when we're in the past, we're only catching snippets of him. We never even learn his name. Everything about him is pieced together by the way he interacted with and influenced others, even after he had passed away. There were some really humorous moments (Ona Vitcus is a real firecracker), and my favorite one was when Ona takes Quinn and his twice-ex-wife, Belle, on a road trip to visit her son to see if he has her birth certificate. Ona gave up this son for adoption when he was a brand-new baby, so she never had much of a relationship with him, and she was quite irritated at finding him a ninety-year-old man in a nursing home with a wandering memory. I loved this quote: "Can memory be revisited to allow us to see now what we didn't see then?" If I had to distill the point of this story into one sentence, it would be that. Remembering events from the past enables the characters to see things in a new light and move forward with renewed hope. Content note: Some bad language, including heavy use of the f-word in one scene; some offstage immorality. We knew this day would come, but that doesn't mean we weren't sad when it finally did. 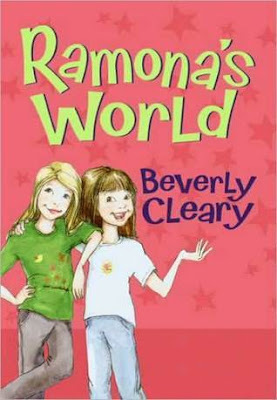 We finished the last book in the Ramona Quimby series, and it felt like the end of an era. For the last five (six?) years, we've been slowly working our way through both the Henry Huggins and Ramona Quimby series (which I kind of think of as one big series since there is some overlap between characters). We finished the last Henry book over a year ago, but we held off on the last Ramona book because we've been pacing ourselves so that Ramona's age matched with Aaron's age. But with the end of Aaron's 4th grade year fast approaching, we knew we couldn't hold out any longer. So we read it. And it was a sweet end to the series. The slow maturing of Ramona through each book is masterfully done. By the time she's in fourth grade, she has cast off a lot of her childish habits while maintaining her spunky creativity, which still leads to some embarrassing accidents (I think the scene where Ramona falls through her friend's dining room ceiling will remain on my kids' favorite list forever). P.S. In writing this review, I was shocked to discover that I never wrote up a review of the seventh book in this series, Ramona Forever. I don't know how this happened. One of those unintentional oversights. When I was in probably the fourth or fifth grade, I had to write a tall tale. To learn the key elements and style of a tall tale, I read stories about Paul Bunyan and Pecos Bill. If I'd known about Josh McBroom, I could have added him to the list, and I think I would have enjoyed his story most of all. 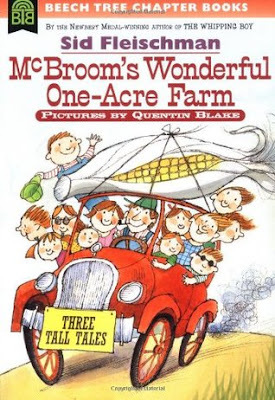 I mean, how could you not like a tale about a farmer with eleven children who buys an eighty-acre farm, only to find out he's been hoodwinked and seventy-nine of those acres lie below ground. But then he finds out that the soil on his one-acre is the most fertile he has ever known. It can grow beautifully ripe vegetables in under an hour and a forest overnight. Perhaps McBroom didn't get taken after all. ". . . when I poked the gun barrel out the window, well, the wind bent it like an angle iron. The buckshot flew due south. I found out later it brought down a brace of ducks over Mexico." "The air got so thick with hoppers you could swing a bucket once and fill it twice." "Those infernal dinner guests had eaten the socks right out of my shoes . . . All they left were the holes in the toes." Anytime McBroom needs his family, he calls all eleven of his children in one long breath. Of course we had to try it out for ourselves, and the boys and I each took a turn trying to remember all eleven names and stringing them together just like McBroom: "Willjillhesterchesterpeterpollytimtommarylarryandlittleclarinda!" My one complaint is that this book was much, much too short, but luckily there are more McBroom adventures, which I'm sure we'll read this summer. I can't recommend this enough as a great summer readaloud. 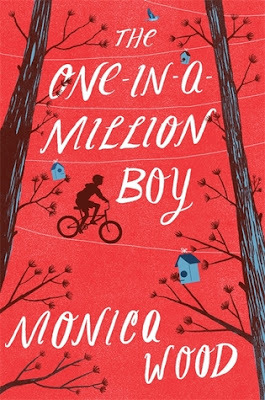 I think this book has been quite popular on some school reading lists, but I hadn't heard anything about it until it was chosen as the middle grade novel for our May book club. 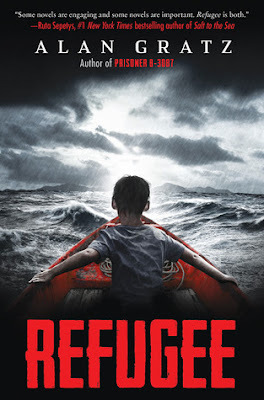 It follows three refugees: Joseph escaping Nazi Germany in 1938; Isabel leaving Cuba in 1994; and Mahmoud fleeing Syria in 2015. For the time periods and cultures and circumstances being so different, it was amazing to see the similarities between their stories. Maybe too similar . . . The book was presented in a way that really showcased the parallel nature of their journeys, and I'll admit that at times it seemed a little too contrived or formulaic. For example, first we had the set of chapters where a character fell into the ocean; next came the chapters where each main character did something brave and heroic to help his family survive; those were followed by the chapters where a loved one was lost. Subtle, this book was not. I understand that it was written for children, but I don't believe the similarities needed to be so overt in order for kids to pick up on them. However, in spite of the less-than-subtle parallels, I still ended up learning a great deal about these three events, one of which is, sadly, not finished. I appreciated the author's note at the end, which shared a little bit more about the historical accuracy of each story. And I loved the connections between all three characters at the end, even if it was a little contrived. So I would definitely recommend this book, and I plan on having Aaron and Maxwell listen to it over the summer. I saved my favorite for last. Oh, this book. I loved every part of it. I spent the whole time nodding my head and fist pumping the air and shouting, "Yes, Yes, YES!!!!" Everything I love and believe in about reading aloud as a family was validated among these pages. 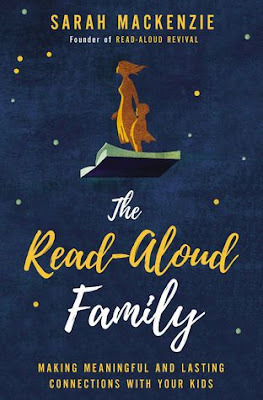 For those who may not know, Sarah Mackenzie is the host of the fabulous podcast, The Read-Aloud Revival, which, as the title suggests, is all about igniting, or rekindling, as the case might be, a love of literature and stories as a family and in the process building lasting connections with one another. lists of potential read-alouds that will be enjoyed by all ages. I obviously didn't need to be convinced that reading aloud is a great use of my time as a mother, so some might wonder if I actually found this book to be all that helpful. But I did! It fired up my passion just in time for summer vacation; it inspired me to make reading to Ian more of a priority (I admit that I find reading to one-year-olds a little bit exasperating); it helped me know how to start up conversations with my kids about what we're reading together and what they're reading on their own (seriously, the chapters on mastering the art of conversation and how to ask compelling questions were a goldmine of information); and the book lists at the end brought out my nerdy side--I read them straight through while simultaneously putting at least a dozen of the recommendations on hold at the library. They weren't just a rehashed version of other book lists; they included very new and current books and were highly curated to be the most beneficial in a read-aloud setting. I plan to make this one of my go-to gifts for new moms because honestly, what better tradition could you start than one of reading aloud as a family? What did you read in May? I'd love to hear! Personally, I think you’re going to want your own copy of it. It’s just too good of a reference! Like you, Amy, I was already on board with the concepts, but still found The Read-Aloud Family an inspirational read. And, Torrie, I would second Amy on wanting to own a copy. I read mine on Kindle but highlighted many passages.